1) The biblical passages regarding the flood make it clear that it was global. Genesis 7:11 states that “all the springs of the great deep burst forth, and the floodgates of the heavens were opened.” The clearest verses that show the extent of the flood are Genesis 7:19-23 . Regarding the waters, “They rose greatly on the earth, and all the high mountains under the entire heavens were covered. The waters rose and covered the mountains to a depth of more than twenty feet. Every living thing that moved on the earth perished—birds, livestock, wild animals, all the creatures that swarm over the earth, and all mankind. Everything on dry land that had the breath of life in its nostrils died. Every living thing on the face of the earth was wiped out; men and animals and the creatures that move along the ground and the birds of the air were wiped from the earth. Only Noah was left, and those with him in the ark.” **With man-made theories changing periodically, I have no problems holding to the global flood model based on the Bible's history; moreover, I think a flood based on the 5 simple facts covered here (I could go over a LOT more), serve as a cumaltive case argument in favor of the Noah account. Peter also describes the universality of the flood in 2 Peter 3:6-7 , where he states, “By these waters also the world of that time was deluged and destroyed. By the same word the present heavens and earth are reserved for fire, being kept for the day of judgment and destruction of ungodly men.” In these verses Peter compares the “universal” coming judgment to the flood of Noah's time and states that the world that existed then was flooded with water. Further, many biblical writers accepted the historicity of the worldwide flood (Isaiah 54:9 ; 1 Peter 3:20 ; 2 Peter 2:5 ; Hebrews 11:7 ). Lastly, the Lord Jesus Christ believed in the universal flood and took it as the type of the coming destruction of the world when He returns (Matthew 24:37-39 ; Luke 17:26-27 ). 2) A gigantic flood may be the most common of all legends—ever. Almost every ancient culture had legends telling of a traumatic flood in which only a few humans survived in a large boat.a This cannot be said for other types of catastrophes, such as earthquakes, fires, volcanic eruptions, disease, famines, or drought. More than 230 flood legends contain many common elements, suggesting they have a common historical source that left a vivid impression on survivors of that catastrophe. Chinese Word for Boat. Classical Chinese, dating to about 2500 B.C., is one of the oldest languages known. Its “words,” called pictographs, are often composed of smaller symbols that themselves have meaning and together tell a story. 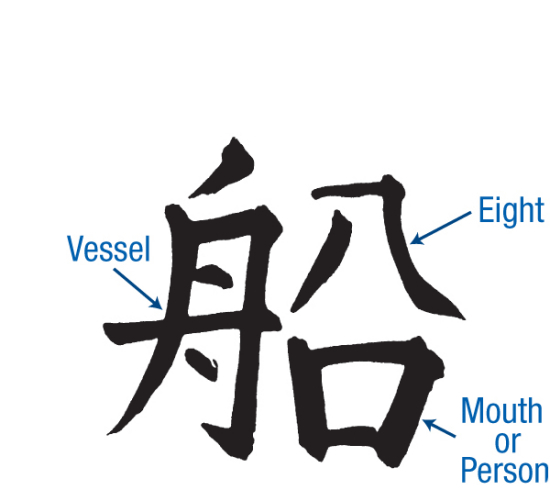 For example, the classical Chinese word for boat, shown above, is composed of the symbols for “vessel,” “eight,” and “mouth” or “person.” Why would the ancient Chinese refer to a boat as “eight-person-vessel”? How many people were on the Ark? Every major mountain range on earth contains fossilized sea life—far above sea level and usually far from the nearest body of water. Attempts to explain “shells on mountaintops” have generated controversy for centuries. An early explanation was that a global flood covered these mountains, allowing clams and other sea life to “crawl” far and high. However, as Leonardo da Vinci wrote,b under the best conditions, clams move too slowly to reach such heights, even if the flood lasted hundreds of years; besides, the earth does not have enough water to cover these mountains. Others said that some sea bottoms sank, leaving adjacent sea bottoms (loaded with sea creatures) relatively high—what we today call mountains. How such large subterranean voids formed to allow this sinking was never explained. Still others proposed that sea bottoms rose to become mountains. Mechanisms for pushing up mountains were also never satisfactorily explained. Because elevations on earth change slowly, some wondered if sea bottoms could rise miles into the air, perhaps over millions of years. However, mountaintops erode relatively rapidly—and so should fossils slowly lifted by them. Furthermore, mountaintops accumulate few sediments that might protect such fossils. Some early authorities, in frustration, said the animals grew inside rocks—or the rocks simply look like clams, corals, fish, and ammonites. Some denied the evidence even existed. 4) The Cretaceous column of geology is the only layer found worldwide; it is formed under water. Thus we can conclude that at some point, all the earth was under water. 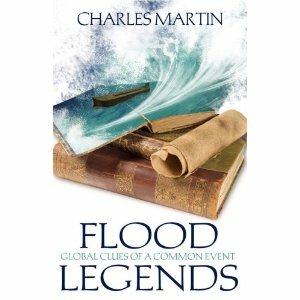 Native global flood stories are documented as history or legend in almost every region on earth. Old world missionaries reported their amazement at finding remote tribes already possessing legends with tremendous similarities to the Bible's accounts of the worldwide flood. H.S. Bellamy in Moons, Myths and Men estimates that altogether there are over 500 Flood legends worldwide. Ancient civilizations such as (China, Babylonia, Wales, Russia, India, America, Hawaii, Scandinavia, Sumatra, Peru, and Polynesia) all have their own versions of a giant flood. These flood tales are frequently linked by common elements that parallel the Biblical account including the warning of the coming flood, the construction of a boat in advance, the storage of animals, the inclusion of family, and the release of birds to determine if the water level had subsided. The overwhelming consistency among flood legends found in distant parts of the globe indicates they were derived from the same origin (the Bible's record ), but oral transcription has changed the details through time. Perhaps the second most important historical account of a global flood can be found in a Babylonian flood story in the Epic of Gilgamesh. When the Biblical and Babylonian accounts are compared, a number of outstanding similarities are found that leave no doubt these stories are rooted in the same event or oral tradition. Take the seed of all creatures aboard the ship Gen. 6:19 And of every living thing of all flesh you shall bring. Gen. 7:16 The Lord shut him in. I sent out a dove . . . The dove went, then came back, no resting-place appeared for it, so it returned. Gen. 8:8 He sent out a dove...But the dove found no resting-place . . . and she returned. Then I sent out a raven . .it was the waters receding, it ate, it flew about to and fro, it did not return. Gen. 8:7 He sent out a raven, which kept going to and fro until the waters had dried up from the Earth. I made a libation on the peak of the mountain. Gen. 8:20 Then Noah built an altar to the Lord (on the mountain) and offered burnt offerings. Once upon a time the rivers began to flood. The god told two people to get into a ship. He told them to take lots of seed and to take lots of animals. The water of the flood eventually covered the mountains. Finally the flood stopped. Then one of the men, wanting to know if the water had dried up let a dove loose. The dove returned. Later he let loose a hawk which did not return. Then the men left the boat and took the animals and the seeds with them. The Chinese classic called the Hihking tells about "the family of Fuhi," that was saved from a great flood. This ancient story tells that the entire land was flooded; the mountains and everything, however one family survived in a boat. The Chinese consider this man the father of their civilization. This record indicates that Fuhi, his wife, three sons, and three daughters were the only people that escaped the great flood. It is claimed, that he and his family were the only people alive on earth, and repopulated the world. Gilgamesh met an old man named Utnapishtim, who told him the following story. The gods came to Utnapishtim to warn him about a terrible flood that was coming. 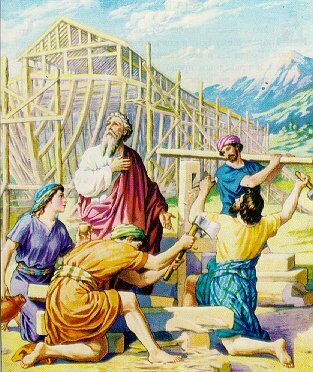 They instructed Utnapishtim to destroy his house and build a large ship. The ship was to be 10 dozen cubits high, wide and long. Utnapishtim was to cover the ship with pitch. He was supposed to take male and female animals of all kinds, his wife and family, provisions, etc. into the ship. Once ship was completed the rain began falling intensely. The rain fell for six days and nights. Finally things calmed and the ship settled on the top of Mount Nisir. After the ship had rested for seven days Utnapishtim let loose a dove. Since the land had not dried the dove returned. Next he sent a swallow which also returned. Later he let loose a raven which never returned since the ground had dried. Utnapishtim then left the ship. There was a man by the name of Xisuthrus. The god Chronos warned Xisuthrus of a coming flood and told him to build a boat. The boat was to be 5 stadia by 2 stadia. In this boat Xisuthrus was to put his family, friends and two of each animal (male and female). The flood came. When the waters started to recede he let some birds loose. They came back and he noticed they had mud on their feet. He tried again with the same results. When he tried the third time the birds did not return. Assuming the water had dried up the people got out of the boat and offered sacrifices to the gods. A long time ago lived a man named Manu. Manu, while washing himself, saved a small fish from the jaws of a large fish. The fish told Manu, "If you care for me until I am full grown I will save you from terrible things to come". Manu asked what kind of terrible things. The fish told Manu that a great flood would soon come and destroy everything on the earth. The fish told Manu to put him in a clay jar for protection. The fish grew and each time he outgrew the clay jar Manu gave him a larger one. Finally the fish became a ghasha, one of the largest fish in the world. The fish instructed Manu to build a large ship since the flood was going to happen very soon. As the rains started Manu tied a rope from the ship to the ghasha. The fish guided the ship as the waters rose. The whole earth was covered by water. When the waters began subsiding the ghasha led Manu's ship to a mountaintop. There is a legend of a flood called the Dreamtime flood. Riding on this flood was the woramba, or the Ark Gumana. 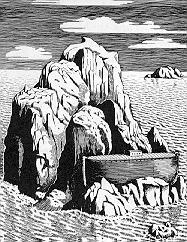 In this ark was Noah, Aborigines, and various animals. This ark eventually came to rest in the plain of Djilinbadu where it can still be found. They claim that the white mans story about the ark landing in the middle east is a lie that was started to keep the aborigines in subservience. This legend is undoubtedly the product of aboriginal legends merging with those of visiting missionaries, and there does not appear to be any native flood stories from Australia. A long time ago, perhaps before the golden age was over, humans became proud. This bothered Zeus as they kept getting worse. Finally Zeus decided that he would destroy all humans. Before he did this Prometheus, the creator of humans, warned his human son Deucalion and his wife Pyrrha. Prometheus then placed this couple in a large wooden chest. The rains started and lasted nine days and nights until the whole world was flooded. The only thing that was not flooded was the peaks of Mount Parnassus and Mount Olympus. Mount Olympus is the home of the gods. The wooden chest came to rest on Mount Parnassus. Deucalion and his wife Pyrrha got out and saw that everything was flooded. They lived on provisions from the chest until the waters subsided. At Zeus' instruction they re-populated the earth. The Toltec natives have a legend telling that the original creation lasted for 1716 years, and was destroyed by a flood and only one family survived. Aztec- A man named Tapi lived a long time ago. Tapi was a very pious man. The creator told Tapi to build a boat that he would live in. He was told that he should take his wife, a pair of every animal that was alive into this boat. Naturally everyone thought he was crazy. Then the rain started and the flood came. The men and animals tried to climb the mountains but the mountains became flooded as well. Finally the rain ended. Tapi decided that the water had dried up when he let a dove loose that did not return. The Ojibwe natives who have lived in Minnesota USA since approximately 1400AD also have a creation and flood story that closely parallels the Biblical account. "There came a time when the harmonious way of life did not continue. Men and women disrespected each other, families quarreled and soon villages began arguing back and forth. This saddened Gitchie Manido [the Creator] greatly, but he waited. Finally, when it seemed there was no hope left, Creator decided to purify Mother Earth through the use of water. The water came, flooding the Earth, catching all of creation off guard. All but a few of each living thing survived." Then it tells how Waynaboozhoo survived by floating on a log in the water with various animals. Ojibwe - Ancient native American creation story tells of world wide flood. Delaware Indians - In the pristine age, the world lived at peace; but an evil spirit came and caused a great flood. The earth was submerged. A few persons had taken refuge on the back of a turtle, so old that his shell had collected moss. A loon flew over their heads and was entreated to dive beneath the water and bring up land. It found only a bottomless sea. Then the bird flew far away, came back with a small portion of earth in its bill, and guided the tortoise to a place where there was a spot of dry land. During the period of time called the Pachachama people became very evil. They got so busy coming up with and performing evil deeds they neglected the gods. Only those in the high Andes remained uncorrupted. Two brothers who lived in the highlands noticed their llamas acting strangely. They asked the llamas why and were told that the stars had told the llamas that a great flood was coming. This flood would destroy all the life on earth. The brothers took their families and flocks into a cave on the high mountains. It started to rain and continued for four months. As the water rose the mountain grew keeping its top above the water. Eventually the rain stopped and the waters receded. 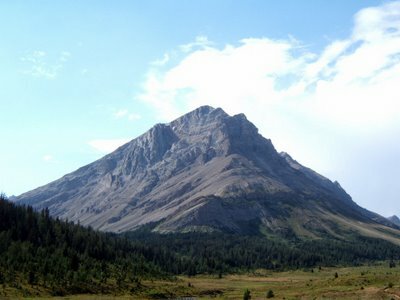 The mountain returned to its original height. The shepherds repopulated the earth. The llamas remembered the flood and that is why they prefer to live in the highland areas. 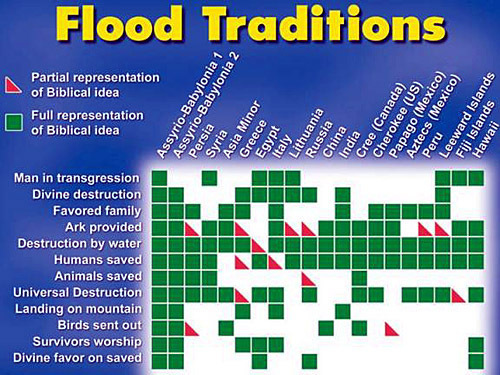 Remember - this is just a handful of facts, and does't even begin to cover all of the areas that support a global flood; but for now we will leave it there and I encourage you to stand by the Bible (if you're a Christian) and to explore the evidences yourselves.